This pattern needs no introduction, as it's taken the sewing world by storm, and I bought it immediately on it's realise on Christmas Eve. It's a PDF only pattern which I don't mind, and I happily stuck together all the coat pieces. I lost the will though with the lining pages, and got it printed by Net Printer. My fabric is a lovely wool/viscose coating fabric from Montreux Fabrics, and my lining is some black lining fabric with red flowers which might have been from ebay, but I can't remember. I'm not going to lie, I had a two issues with this pattern. First was the lack of lengthen/shorten lines. The waist, bust and hips are also not marked, so this created a lot of extra work to find a single markable point on each pattern piece to be able to shorten each piece at the same point. This was an issue for me, as not only did I need to shorten the overall length, but also shorten the bodice and sleeves. This was my biggest problem, and has made me quite ragey during the making of this coat - please feel sorry for Andrew having to listen to me! But I am trying to be constructive, and not just go off on a stabby rant! The second issue was the 10mm seam allowance on the collar, and also the scant instructions on sewing the collar. I found sewing the curved outer edges of the collar stand to the collar to be very tricky with the smaller seam allowance, and the one illustration on the instructions wasn't helpful. I've noticed a few other people have had issues with this too. Also the smaller seam allowance made it difficult to attach the collar and facing to the coat. This bit was pretty frustrating. The instructions say to use the 10mm seam allowance at the neckline, but don't give a seam allowance for the coat front. I used 15mm at the coat front, and then 10mm across the neckline. No idea if that was right though. I found the 10mm seam allowance at the armhole/sleeve head to be odd - I've never seen this before on an armhole. So I added 5mm to both seams, and set my sleeves in using the bias strip method that I used on my black coat. I also noticed that the metric measurements on the printed out instructions don't match up with the imperial measurements, but they do on the By Hand London website. Me, being me, couldn't leave the pattern as it is, and made two mods. I made bound buttonholes using the welt method in Karen from Did You Make That's ebook. Also, I added vents to the sleeves using a tutorial from a Craftsy class called "Classic Tailoring: The Blazer". I didn't do any buttonholes though, and just sewed the buttons on through both layers. My buttons are from ebay. I'm delighted with the top stitching, and ended up using my 1/4" foot for it. It was very easy to do by putting the little guide into the seam. I couldn't find a top stitching foot for my Elna; maybe they don't have one. I don't love my hem, and this is because of the lining which is a bit of a mess. Due to the lack of aforementioned lengthen/shorten lines, my lining ended being too short. By that stage I was pretty fed up, and just winged it with sewing it in, and it's really not my best work. Maybe I'll re-line it a some stage, but right now I couldn't be bothered. That said, I saw a coat in the window of a fancy shop in Belfast today, and the hem was a bit dodgy on it too. This dress is Kwik Sew 3489 which you can read about here. Even though this wasn't the easiest of makes, I like how my coat has turned out, and please don't let my complaints put you off making this pattern, as I obviously got there in the end! 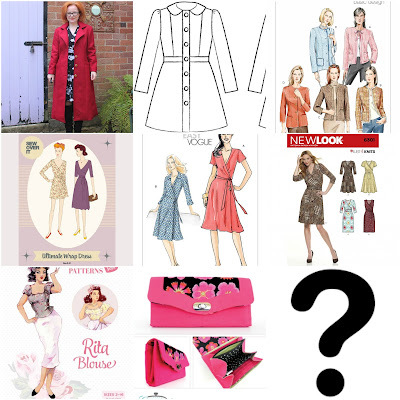 I would say that if you haven't made a coat before, maybe try something else as a first pattern especially if you need to adjust the length significantly, as the instructions really aren't comprehensive enough. I would hate to think of someone feeling that they couldn't ever make a coat because they couldn't work this one out. And finally (and well done if you got to the end! ), this is my third finished item for my 2018 Make Nine; I just haven't blogged the first two yet, but they're for another post. fabulous to have a long coat in that red colour (and great lining). Well done on getting past those difficulties with seam allowance etc - I would have been very frustrated with those situations too. And well done on having 3 of your make9 done! Thanks Colette! I'm loving the colour, and am pretty chuffed about my 3 makes nines. I fear it may be the sewing equivalent of my christmas shopping, where I buy one present in September and feel smug, then panic with about 4 weeks to go! This looks really good - so true what you say about seeing a coat in a shop with a dodgy hem - we are 100 times more critical of things we make ourselves but when we look around at other clothes there are lots of 'dodgy' bits too! I love the pockets on the coat. Thanks for the detailed review of the pattern! I'm tempted by it but I don't think I'd get too much wear out of such a long coat. Congratulations on your new coat! The colour is amazing and I'm delighted with your top stitching too - so professional looking. Also, sleeve vents - best modification ever! That being said, I do empathise with you a lot - this must've been very fiddly if you're not used to small seam allowances! Thanks Vesna! I adore the top stitching, and didn't have to unpick one stitch - which is always pleasing! I agree with you on the 10mm seam allowance for accuracy, and I would use it on my self drafted dress patterns, especially on collars and princess seams. It was the bulkiness of the coat fabric that made it tricky here. I've never used a bought pattern without a seam allowance, but it would never have occurred to me to use anything other than 15mm, but 10mm would definately be easier in some places. Thanks for making me think of it!! Thanks Kathleen! I really love the colour, and can't remember ever having a red winter coat before. Which is frankly incredible when I think that red is a neutral! Thanks Sarah! I'll be interested to see if the sewalong addresses these issues too. It also seems a bit strange to me that it's taken nearly 2 months for anything to be on the By Hand London website about anything to do with the pattern. It really is lovely Lynne. Gorgeous top stitching and button holes. What a shame about the Pattern frustration. Here's a thought about lining... Could you get some very wide black satin ribbon and attach it along the bottom of the existing lining to lengthen it and it would look like a lovely feature. Would save you re-lining. Thanks Diane! I had thought about adding some more of my lining fabric across the bottom, but by that stage I was close to throwing the coat out the window!! I know your frustration in making this coat Lynne, but you did it! Thanks Ruth! I think it would be handier to re-line, as I'm not happy with the lining in the sleeves either! Well done on working through all the frustrations to end up with such a nice finished coat! It was worth all the hassle! Thanks Ruth! It is a pretty snazzy coat, even if I say so myself! !